In January 2012, I bought my first audiobook: Tina Fey’s Bossypants. This outrageously hilarious book led me to read a long string of memoirs by other famous women (Mindy Kaling, Chelsea Handler, Sarah Silverman, Samantha Bee, Jenny Lawson, and Lena Dunham), but tragically, none of them lived up to the reigning comedic queen. I was ready to accept the fact that no one was going to be able to rise up to that level of humor. But then! 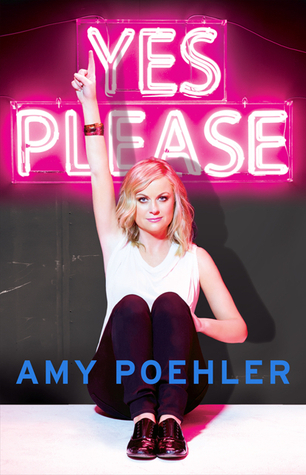 Everyone’s prayers were answered when it was revealed that Amy Poehler would be writing Yes Please. Finally! Who better to top Tina than her “Saturday Night Live” costar and very own BFF? She begins her book with her preface, “Writing is Hard,” which is absolutely perfect for its tongue-in-cheek honesty about the writing process. Each following chapter is filled with her wisdom regarding body image and aging, dating and divorce, and balancing career and parenting. Poehler talks about treating your career like a bad boyfriend and owning up to your mistakes. Her fiercely feminist views are a breath of fresh air, and the way she describes her own frustrations and insecurities as a woman are very relatable. What’s not so relatable is all the shameless name-dropping she does, but you still forgive her for it, because hey, it’s not her fault that she knows a ton of super cool, famous people. I mean, who wouldn’t want to be her friend? She even has a few celebrities guest-star on the audiobook, including Seth Meyers, Carol Burnett, and Patrick Stewart. Her parents also drop by to talk about marriage advice and what Amy was like as a child, making this the most sickeningly cute book I’ve listened to ever. I also really appreciated how much time Poehler spent discussing what actually made her a star: her years at “SNL” and her famous parodies of Hillary Clinton, her experiences on “Parks and Recreation,” and her hosting the Golden Globes. As much as childhood stories can entertain, fans want to be flies on the wall of a celebrity’s most famous moments, and I’m so glad that Poehler shares hers so candidly. And while Yes Please is filled with more sage advice and less hilarious anecdotes than Bossypants, it was so fun to listen to that I finished the audiobook in a weekend. You’ll crack up laughing at everything from Poehler’s lessons learned on mushrooms to the pranks she pulled on her costars. Yes Please is a delightfully charming read that might just make the spot of my favorite book of 2014! This entry was posted in Audiobook Review and tagged Amy Poehler, audiobook, book review, Bossypants, comedy, humor, memoir, Saturday Night Live, Tina Fey, Yes Please by Book Club Babe. Bookmark the permalink. Still waiting for this one from the library, but I’m glad you enjoyed it. Hopefully, it will be worth the wait! Oh it definitely will be!